What does the European Union mean for health and health systems? More than one would think. The EU’s health mandate allows for a comprehensive set of public health actions. And there are other EU policies, though not health related, which have important consequences for governing, financing, staffing and delivering health services. In other words: EU actions affect the health of Europe’s population and the performance of health systems. Given how important health systems are, we need an informed debate on the role of the EU and its contribution. But this is not easy because EU health policy is difficult to comprehend. There is no single strategy with a neat body of legislation implementing it; rather, there are many different objectives and instruments, some of which appear in unlikely places. Understanding the EU role in health is especially important now, when health systems have to deal with a plethora of challenges, the European social model is confronted by the threat posed by the financial crisis, and the EU is facing increasing euro-scepticism in politics. 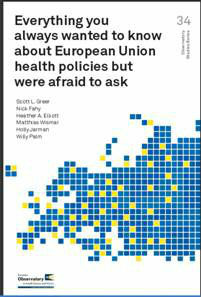 and, because of its growing importance, financial governance and what it means for European health systems. This book is aimed at policymakers and students of public health and health systems in the EU who want to understand how the EU can add value in their quest improving population health and the performance of health systems in Member States.